Five distinct subspecies are recognized; three occur in Alaska and all but one occurs in North America. Cepphus columba columba breeds from Kamchatka to the Bering Strait, C. c. kaiurka is found on the west-central Aleutian and Commander Islands, and C. c. adianta breeds from the central Aleutian Islands to Washington State. The estimated world population is about 235,000 and at least 50% breed in Alaska. Population trends are difficult to track unless a significant event such as the Exxon Valdez oil spill occurs. Efforts to better understand the population include more systematic surveys, minimize impacts of gillnet fisheries, and reduce disturbances at colonies. During the summer breeding season, adults have dark bodies and white wing patches crossed by a small black wedge; their feet are red, as is the mouth lining within their pointed dark bill. In the winter, the birds lighten and become salt and pepper in coloring, making them resemble juvenile birds. This species nests along rocky coastlines from California to Alaska and along the eastern shores of Siberia. 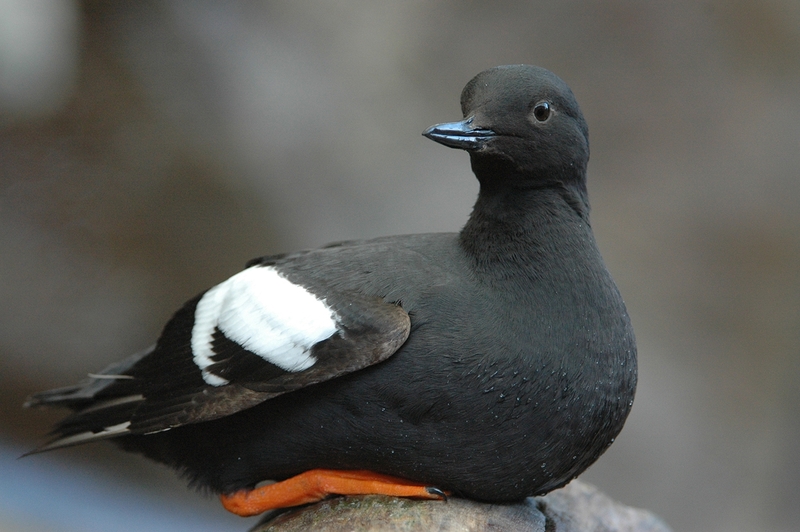 Pigeon Guillemots are flexible in their nest site selection and will use remote offshore islands or onshore sites. They are subtidal and nearshore foraging birds that often use intertidal rocks.